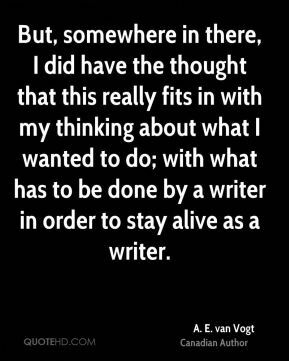 But, somewhere in there, I did have the thought that this really fits in with my thinking about what I wanted to do; with what has to be done by a writer in order to stay alive as a writer. 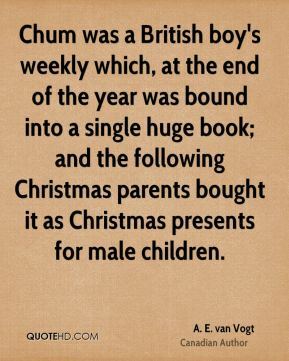 Chum was a British boy's weekly which, at the end of the year was bound into a single huge book; and the following Christmas parents bought it as Christmas presents for male children. 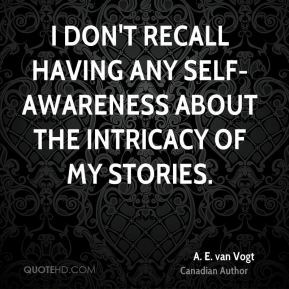 I don't recall having any self-awareness about the intricacy of my stories. I figure that that has a ten year cycle. 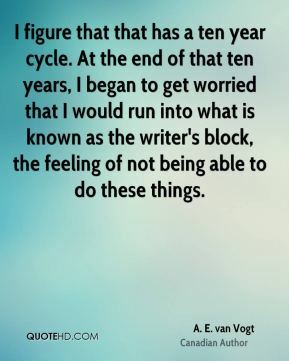 At the end of that ten years, I began to get worried that I would run into what is known as the writer's block, the feeling of not being able to do these things. 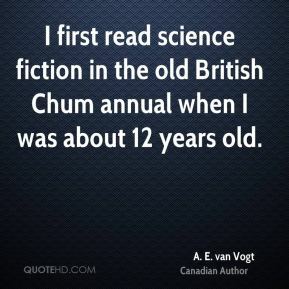 I first read science fiction in the old British Chum annual when I was about 12 years old. 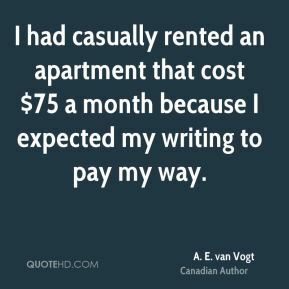 I had casually rented an apartment that cost $75 a month because I expected my writing to pay my way. 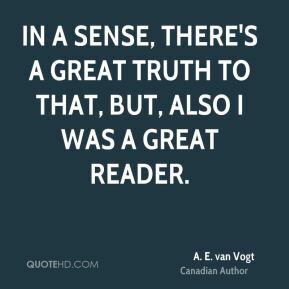 In a sense, there's a great truth to that, but, also I was a great reader. In those days I was new to covers; merely felt pleased that a story of mine had been honored. 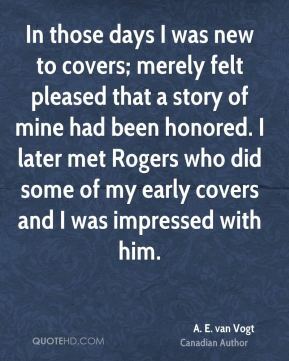 I later met Rogers who did some of my early covers and I was impressed with him. 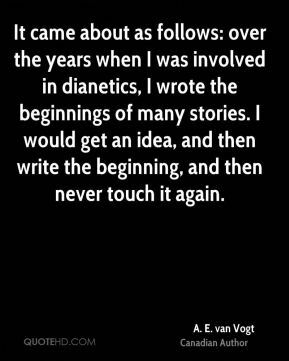 It came about as follows: over the years when I was involved in dianetics, I wrote the beginnings of many stories. I would get an idea, and then write the beginning, and then never touch it again. It's difficult for me to feel that a solid page without the breakups of paragraphs can be interesting. 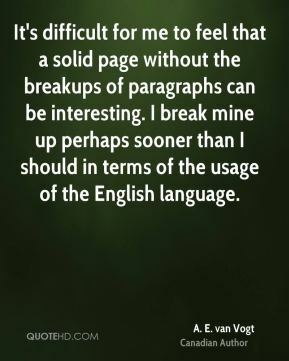 I break mine up perhaps sooner than I should in terms of the usage of the English language. 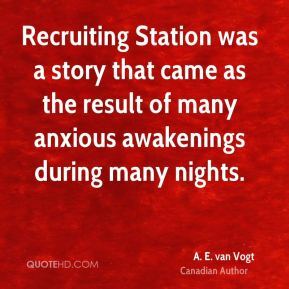 Recruiting Station was a story that came as the result of many anxious awakenings during many nights. The encouragement I got from Campbell was a quick check and praise. 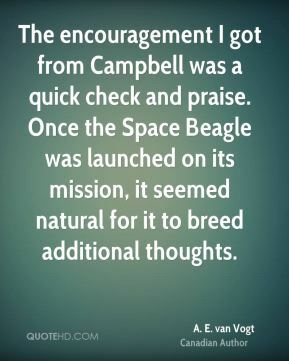 Once the Space Beagle was launched on its mission, it seemed natural for it to breed additional thoughts. 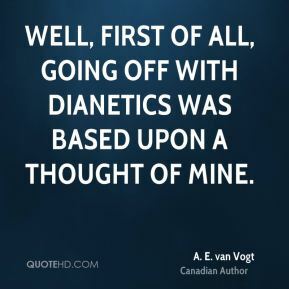 Well, first of all, going off with dianetics was based upon a thought of mine. 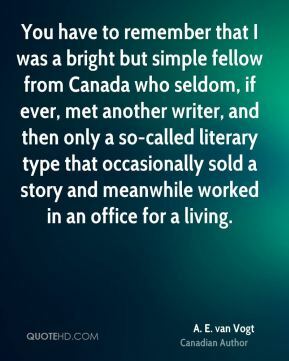 You have to remember that I was a bright but simple fellow from Canada who seldom, if ever, met another writer, and then only a so-called literary type that occasionally sold a story and meanwhile worked in an office for a living.